A gang of four foreigners preying on foreign tourists staying in top end hotels have been arrested by Bangkok police. The modus operandi of the gang was to rent rooms in five star hotels then break into neighboring rooms and steal from safes. Arrested were two Filipino women Miss Greggyia Dion Fabro, 32, and Miss Herrera Joann Gae Dion, 31. They were taken into custody while visiting Suan Phlu Immigration offices on the 28th of November. 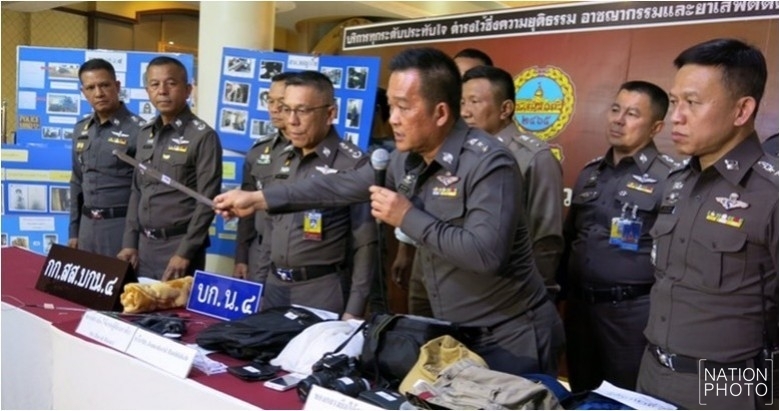 This led to the arrests of two Iranian men Mohsen Razlighi, 40 at a house in Si Khiw, Nakorn Ratchasima and David Rasasi otherwise known as Jomedordi Bahlakeh, 49, outside a hotel in Siriwong. Taken into evidence were clothes used in commission of many crimes tools uses to break open rooms and safes and goods stolen. There were also two vehicles. Bangkok police said at metropolitan HQ yesterday that all had admitted their involvement. The two Filipino women were approached by the Iranians in the Nana area to act as the people who would rent rooms in fancy hotels where nightly charges were 3,000 to 4,000 baht. Once they were there the Iranians would move in and wait for rooms nearby to be empty then break in and remove safes that were taken back to their own room to be prised open and removed of their contents. They are believed to have hit at least five hotels in Thong Lor, Hua Mak, Phaya Thai, Pattaya and Don Hua Lor, Chonburi. But there could be more and met chief Charnthep Sisawech announcing the arrests asked for other potential victims to come forward. The Filipinos said they were paid 1,000 baht a time to rent rooms. Mohsen who has lived in Thailand for many years and has a Thai wife said he was a look out while the other Iranian known as David was the main man. Police have discovered that he was jailed for seven years in 2004 for a similiar string of offences. After release he was deported but then came back to Thailand under a different name. "After release he was deported but then came back to Thailand under a different name"
it's that easy eh . . . I'm disappointed. No photo of the thieves. A room is robbed. Who had adjacent or nearby rooms. Standard procedure. A room is robbed. Who had adjacent or nearby rooms. Hummmm. It sure would not take long unless they had fake IDs. Also, it sure looks like the women turned on the guys in order to get a lighter sentence. Stupid to commit crimes with another person(s)...especially women. The women will get off easy because they turned in the guys while the men will have a very miserable life in front of them. Must be serious pointing stick in use. Sounds like a good bust of this scum well done . I believe that their laws and punishments only apply to crimes committed among themselves. When Infidels are the victims, anything goes. Don't you just hate being a 'foreigner' here like the rest of the world and his wife. Although I am impressed by the amount of police that can remain static whilst fitting in the photo frame, what is less impressive here are the picture boards. They just look like someone has stuck photos on boards. These guys should be immediately be sent to inactive posts to brush up on their powerpoint skills. Inexcusable! A press conference in any country around the world is not done this way. What are those blokes behind doing? Just to have their silly faces taken so others would know they are involved and to gain credit? They just look so stupid to me!